I am making bentos recently but keep forgetting to post them. Sorry! After reading the article on the monbento bento boxes at JustBento, I had to order some of those boxes immediately. 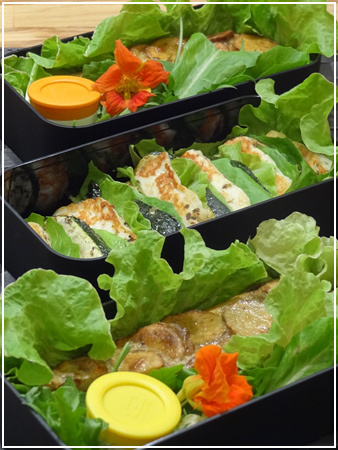 They arrived last Friday, so this is the first bento made in them! The boxes themselves are roomy, sturdy, and overall have a very high quality feeling to them. They are somewhat expensive but well worth the higher price, I think – they really feel indestructible! The lids close nice and tightly and have a sealable hole for microwaving. I ordered two of the “original” black boxes – I have found that I like the contrast of black boxes best when making bentos. Since each layer of the box is 500ml, which is only slightly less than a “normal” Japanese box, three layers are just enough for the BF and me. I stuffed two boxes with the same base food, and we will share the (only lightly filled) third box at work. In the future, I am thinking about using the third (and/or fourth) layer to bring salad and other side dishes. I had also ordered the grey silicone mold for making oven-baked food fitting precisely to the box, and immediately had to try it out by making a Spanish potato tortilla in it. It worked beautifully and the tortilla disconnected from the mold without problem. BF and I will each get half of it, with a side of homegrown mixed lettuces, pan-fried Halloumi and zucchini. The screw-top sauce cups (also new) hold olive oil and balsamico dressing and ajvar. PS: I noticed that comments were turned off on my recent posts. Sorry! I’ve turned them on again now. Dere Were Rabbit, I was browsing the web for recipes to go with the Monbento silicone mold and stumbbled upon your lovely blog! Would you care to share your recipe for the Spanish potato tortilla with me? *waves* It’s not really hard at all, and I kind of cheated with the tortilla in the first place. Those are leftover oven-baked potato slices (though I suppose wedges or other shapes would work too) that I just tossed with eggs, salt and pepper and baked in the mold in the oven until the egg was cooked.